The decorative films and foils market report covers comprehensive information about market trends, volume (Million sq. meter) and value (US$ Mn) projections, market dynamics, competition and recent developments in the global decorative films and foils market for the study period of 2013 to 2026. The global decorative films and foils market is expected to create an absolute $ opportunity worth US$ 10.1 Billion during the forecast period, while registering a CAGR of 5.7%, by value, for the period between 2018 and 2026. The growing construction industry, increasing spending on furniture, demand for improved aesthetic in residential and commercial spaces are some of the factors expected to drive the robust growth of the global decorative films and foils market. The segments of the decorative films and foils market, based on material type, are polyvinyl chloride, polyester, polypropylene and vinyl. The polyvinyl chloride segment is expected to dominate the decorative films and foils market in terms of value as well as volume during the entire forecast period. Polyvinyl chloride decorative films and foils find extensive usage, owing to their cost effective and reliable application for various types of substrates. Polyvinyl chloride foils are widely used in the furniture industry across all regions, mostly due to their long lifespan and affordability. However, environmental concerns concerning the chemical composition of decorative films and foils are increasing the usage of polypropylene decorative films and foils as they are considered non-toxic and more environment-friendly. The polyvinyl chloride decorative films and foils segment is projected to account for 43.4% of the absolute dollar opportunity created in the decorative films and foils market during the forecast period. The decorative films and foils market has been segmented on the basis of application into furniture, doors & windows, flooring and automotive interior & exterior. Decorative films and foils find widespread application in furniture making as they help protect the wooden substrate from physical damage such as scratches, damage from spillage of water or other liquids, protection from stains and so on. Decorative films and foils also find significant application for doors and windows, especially with films for glass doors and windows witnessing high demand, owing to their ability to mimic the distinct visual pattern of specially treated glass such as etched glass and frosted glass. Also, with the energy efficient benefits of window films, the doors and windows application segment is expected to witness strong growth in the decorative films and foils market during the forecast period. The doors & windows segment is projected to account for 32% of the total absolute $ opportunity created in the decorative films and foils market during the forecast period. Amongst all end use sectors analyzed in this global decorative films and foils market study, the commercial sector is expected to register 1.7X growth in terms of value during the forecast period. This growth is led by the increasing demand from commercial end users such as offices, shopping and retail establishments, the hospitality industry and others. The changing lifestyles of urban customers have brought into focus the importance of design and aesthetics in commercial spaces, which is also true for the residential end use sector, supporting the growth of the decorative films and foils market. The commercial sector is expected to account for 56.3% of the total absolute $ opportunity created during the forecast period in the global decorative films and foils market. The strong commercial and residential construction sector in China and increasing industrialization and urbanization are pegged to create a robust foundation for the growth of the decorative films and foils market during the forecast period. The Asia Pacific excluding Japan and China (APEJC) decorative films and foils market is expected to grow 1.6X over the forecast period and is expected to be followed by Western Europe and North America in terms of growth rate. China, in particular, will lead the growth in the global decorative films and foils market with unprecedented levels of urbanization and increasing per capita incomes. 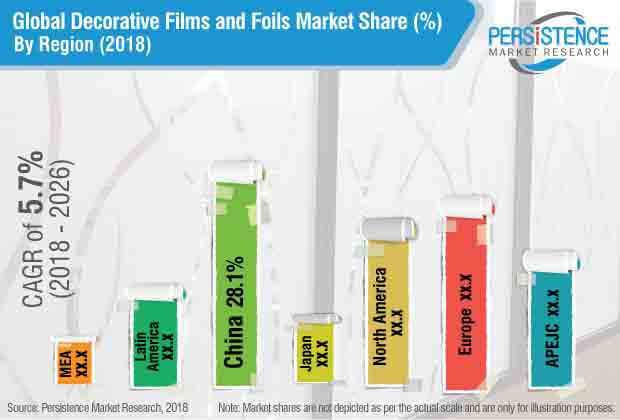 Collectively, China and Asia Pacific excluding Japan and China (APEJC) are projected to create an absolute dollar opportunity of more than US$ 4.9 Billion during the forecast period in the decorative films and foils market. The global decorative films and foils market is highly fragmented, with no market player dominating the sector with a sizable share. Globally, the top 10 players in the market collectively hold less than 40% the market share. In the recent past, the decorative films and foils market has witnessed significant developments from the competition perspective. New product launches, expansion and collaboration are some of the key preferred strategies opted by key players to expand and sustain in the global decorative films and foils market. Some of the prominent players covered in this market study on the global decorative films and foils market include LG Hausys, Ltd, Avery Dennison Corporation, Jindal Poly Films Ltd, Klöckner Pentaplast, Renolit, Omnova Solutions, Inc., Ergis Group and Mondoplastico S.p.A., apart from the various regional players in each of the market geographies. How has the decorative films and foils market evolved over the past four years? What shape is the decorative films and foils market expected to take in terms of volume and value during the study period? What are some of the prevailing market dynamics in the decorative films and foils market? What are the competition developments and trends in the decorative films and foils market? What are some of the underlying macro-economic and industry factors impacting the growth of the decorative films and foils market? What are the important key challenges, opportunities and improvement factors for decorative films and foils market players? What are the important market positioning and key strategies of key manufacturers as per the decorative films and foils market taxonomy? How is the competition structured at present and how has it evolved in the decorative films and foils market over the past few years?